Introduction: Traumatic neglected dislocations of hip in children are rare entity. Neglected traumatic dislocations of hip in children along with heterotopic ossification are still rare. Post traumatic neglected hip dislocations are to be diagnosed as early as possible and have to be treated with precision and aggression as the outcome of treatment for the same is not predictable. 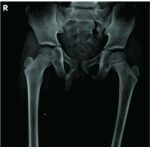 Case Report: 5 year female with post-traumatic neglected hip dislocation with heterotopic ossification forming a pseudoacetabulum postero-superiorly in which femur head was lodged. The girl was operated by open reduction using Moore’s Posterior approach and showed good results. Here is a mention of a rare case with a good 18 months follow up with no complication . Conclusion: Post-traumatic neglected posterior hip dislocation mostly requires open reduction and relocation of femoral head in original acetabulum with concentric reduction. Heterotopic ossification is a rare but known complication of traumatic dislocation of hip in children. Good results can be achieved in such cases and regular follow-up of patient is required post-operatively. 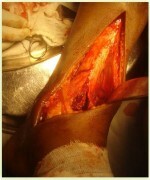 Keywords: Neglected Post-traumatic, hip dislocation,heterotopic ossification. Traumatic dislocation of hip in children is a rare entity accounting for less than 5% of pediatric dislocation and neglected post traumatic dislocation of hip is much more rare [1,2]. Of them posterior dislocation of hip is more common than anterior[1,2]. The character of injury tends to vary, in that children under the age of 6 years suffer isolated hip dislocation due to low energy trauma, whereas older children require high energy trauma[1,2]. 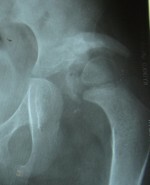 Most of the dislocation of hip in children can be reduced easily but delay in reduction of hip of more than 6 hours are associated with poor outcome because as the time interval between dislocation and reduction increases, incidence of complications like avascular necrosis of femoral head, redislocation, heterotopic ossification and chondrolysis . There have been very few cases of post-traumatic neglected posterior dislocation of hip  (Table 1). Heterotopic ossification in neglected post traumatic posterior dislocation in children is known but devastating and a very rare occurrence .We report one such case. A 5 year female child resident of a village in Uttar Pradesh presented with history of fall from height in school after which she was unable to walk due to pain in left hip region. The patient was taken to local quack where she was treated with massaging and wooden splintage around left hip region for 2-3 weeks and was kept on bed rest. After removal of splintage patient was unable to bear weight on left lower limb due to pain. The patient was brought 4 months post trauma to our hospital for treatment. On clinical examination patient had findings suggestive of posterior dislocation of femoral head. She also had true and apparent shortening of 4 centimetres. Range of motion at left hip was painful and restricted , associated with muscle spasms so under normal condition telescopy couldn’t be illustrated but it was found to be positive under anaesthesia. Examination of opposite hip, spine and both knees was normal. X-ray showed posterior dislocation of hip with heterotopic ossification postero-supero-laterally forming pseudo-acetabulum ( Fig. 1 & 2).There was no evidence of acetabular fracture or femoral head/neck fracture. Same findings were confirmed on C.T. scan ( Fig. 3 & 4). All lab investigations were within normal limits including serum calcium, phosphorous and alkaline phosphatase. Patient was kept on skeletal traction for 3 weeks with weight of 3 kilogram . X-rays taken after 3 weeks of traction revealed no descent of femoral head or any other change. The patient was operated by Moore’s southern approach open reduction of dislocated hip after removing the fibrosis in original acetabulum and clearing it, releasing the capsule. Heterotopic mass was excised and head was reduced in orginal acetabulum followed by capsulorrhaphy. Intra operatively reduction was checked and was stable, congruent and concentric through all range of motions of hip. Under C-arm guidance head was fixed to acetabulum with a single K wire of 1.6 mm (0.062 inch) as a precautionary measure in view of non compliance of patient and parents( Figure 5). Post operatively child was kept in hip spica for 8 weeks and course of indomethacin was given for 3 weeks . Patients post operative status was uneventful. Spica cast was changed at end of 3 weeks under anaesthesia. K wire was removed at 6 weeks along with spica cast (Fig. 5). On examination after removal K wire and spica cast under C-arm congruency of reduction and stability of femoral head was checked through out the range of motion of hip. Thereafter gradual mobilisation of hip was started. The patient was kept on nil weight bearing for 1 month, followed by partial weight bearing for 3 weeks and then full weight bearing. Histopathology report of excised mass forming pseudo-acetabulum revealed as mature bone suggestive of heterotopic ossification. Currently 18 months post surgery patient is able to walk full weight bearing with full range of motion of left hip and no limb length discrepancy (Fig. 6). The patient is also able to squat and run with no X-ray or clinical evidence of avascular necrosis of femoral head (Fig. 6). Patients entire heterotopic mass was removed and throughout our follow-up 18 months there were no evidence of reappearence of the same. Post traumatic hip dislocation in children is a rare entity and its neglected type is much rarer as stated by Kumar et al . We have made a table of all the case series of “Neglected Post-traumatic dislocation of hip in children “ searched from pubmed and google from the available literature( Table 1). This table clearly shows that the results vary and are not predictable and such occurrences are indeed rare. Traumatic posterior dislocation are more common than anterior type [1,2]. Post- traumatic dislocation of hip are to be treated as early as possible and best results are obtained by doing closed reduction within 6 hours of trauma . In neglected post traumatic dislocation of hip in children no fixed time interval can be framed within which surgery is advised. Our case further adds to case series of Banskota et al  confirming that good prognosis in such neglected cases in children can be achieved by open reduction.. Heterotopic ossification around hip in children without any associated acetabular or proximal femur fracture in post- traumatic neglected dislocation of hip is very rare [1,2]. Its common sites around hip are anterior capsule, proximal femur, behind belly of illiopsoas and posterior capsule. Heterotopic ossification can result after closed reduction of hip in children [1,2]. Preoperative extent of heterotopic ossification has previously been suggested as being the main risk factor for recurrence after excision [8,9]. Some studies defer from this statement too . Heterotopic ossification is more common in patients of all ages with head injury and spinal cord trauma as they are often associated with bone fracture, sepsis, prolonged immobilization, neurovegetative disorders, etc [10,11]. It is much common post surgery by anterior approach in all age group and post arthroplasty by any approach in adults .Early surgical intervention minimises the development of intra-articular pathology, osteoporosis and the resultant complications without increasing the risk of recurrence of heterotopic ossification . In study by Mehlmann et al, 3 children out of 42 had developed heterotopic ossification and required excision .Thus heterotopic ossification is a known complication. Very few cases reporting such heterotopic ossification forming pseudo-acetabulum have been mentioned in literature  and we could find none associated with neglected post-traumatic dislocation. According to Odak et al such pattern of heterotopic ossification suggests chronic instability or dislocation of hip and it may be symptomatic or asymptomatic as patient might walk with limp even in presence of dislocation. Our study showed that though heterotopic ossification was Booker IV type, post excision it did not recur and yielded good functional results at end of follow-up. Since this unusual form of heterotopic ossification have been encountered in few cases and has no terminology to denote it, we would like to name it as “ Pseudo-Heterotopic Acetabulum Phenomenon ( PHAP)”. Neglected post traumatic hip dislocation in children do not respond well to conservative line of treatment but good results are evident with appropriate surgical treatment even with posterior approach with concentric reduction of femoral head with no evidence of avascular necrosis or instability as seen in table 1. In our case too a longer follow up will be needed to see evidence of these complications but early good results are encouraging. Heterotophic ossification in shape of a pseudoacetabulum in cases of neglected hip dislocations are not reported. Open reduction with excision of these “Psuedo-Heterotopic Acetabulum Phenomenon” can give good results even in these neglected cases. More studies and evaluation regarding the same is necessary. 2. S Terry Canale. Fractures and dislocation in children in S Terry Canale and James H Beaty Campbell’s Operative Orthopaedics, Volume 2,ed 11, p 1628-1630, 2008. 3. Mehlman CT, Hubbard GW, Crawford AH, Roy DR, Wall EJ. Traumatic hip dislocation in children. Long-term followup of 42 patients. Clin Orthop Relat Res. 2000 Jul;(376):68-79. 4. Zrig M, Mnif H, Koubaa M, Abid A. Traumatic hip dislocation in children. Acta Orthop Belg. 2009 Jun;75(3):328-33. 5. Vanden Bossche L, Vanderstraeten G. Heterotopic ossification: a review. J Rehabil Med. 2005 May;37(3):129-36. 7. Banskota AK, Spiegel DA, Shrestha S, Shrestha OP, Rajbhandary T. Open reduction for neglected traumatic hip dislocation in children and adolescents. J Pediatr Orthop. 2007 Mar;27(2):187-91. 8. Seegenschmiedt MH, Micke O, Heyd R. Heterotopic ossification: general survey for all sites. In: Seegenschmiedt MH, Makoski HB, Trott KR, et al., eds. Radiotherapy for non-malignant disorders. Contemporary concepts and clinical results, medical radiology, radiation oncology. Berlin-Heidelberg-New York: Springer, 2007;333-356. 9. Brooker AF, Bowerman JW, Robinson RA, Riley LH Jr. Ectopic ossification following total hip replacement. Incidence and a method of classification. J Bone Joint Surg Am. 1973 Dec;55(8):1629-32. 11. Simonsen LL, Sonne-Holm S, Krasheninnikoff M, Engberg AW. Symptomatic heterotopic ossification after very severe traumatic brain injury in 114 patients: incidence and risk factors. Injury. 2007 Oct;38(10):1146-50. 12. Genet F, Marmorat JL, Lautridou C, Schnitzler A, Mailhan L, Denormandie P. Impact of late surgical intervention on heterotopic ossification of the hip after traumatic neurological injury. J Bone Joint Surg Br. 2009 Nov;91(11):1493-8. 14. Wilchinsky ME, Pappas AM. Unusual complications in traumatic dislocation of the hip in children. J Pediatr Orthop. 1985 Sep-Oct;5(5):534-9.